It's the time of year when the geese are flying south. They arrive here in Virginia in September. I can hear them approaching from the forest behind us. You can't help but look upward and watch as the chorus gets louder. They fly in V formation so they can all make it. They could not do it alone. Maybe that's why we look up in wonder ... desiring to have that kind of teamwork to make life work for us. Flying in formation increases their flight range by 71% a day. Air waves created each time a bird flaps its wings provide an uplift for the next one in formation. 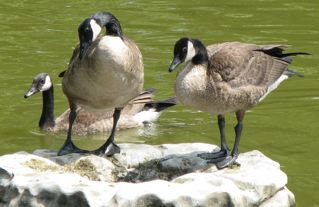 It offers support and decreases the work load of all the geese behind it. This conserves much needed energy for them to make enough distance daily and allows for the oldest, the youngest and even the weakest to arrive at their destination in time. God tells us, "Let us not give up meeting together, as some are in the habit of doing, but let us encourage one another" (Hebrews 10:25). It's easy to find fault with the local churches. None of them are doing it perfectly, but then they weren't in Paul's time either. Paul was always writing letters to the churches with instructions. The church is made up of imperfect people, so it's not the place to look for somebody who's got it all right. Pastors are also human, not divine. We only see in others what is in ourselves, that's why we are told not to judge lest we be also judged accordingly. We weren't designed to fly solo any more than geese. We need the uplift no matter what our maturity level is. We are to encourage each other and no matter how independent we are, we need the fellowship of believers to take us to our destination. When an independent or disoriented goose goes on its own, it will soon find itself adrift. Its wings become heavy from exhaustion and it loses altitude and begins to drop. The increasing pressure of the wind resistance pulls its weakened body back into formation alongside its fellow pilgrims. Jesus tells us to "look at the birds" (Matthew 6:26). We can learn a lot from God's Creation. Are you out there trying to make it on your own and losing altitude? Maybe you have already crashed into the stormy sea of life and lay bruised and beaten on the rocks. There's still life to be lived! Use your last ounce of energy and get back into a church. Get into formation (and fellowship) and stay there. There's a church that will fit. You'll find one that has "geese" like you and it will make your migration through this earthly world a lot easier. Get the phone book, Google some churches and find several that you're going to begin visiting. You'll know which one is right ... as long as you're not measuring it against perfect. Get some lift under your wings from the worship music or the message or a small life group that meets during the week. Don't fly alone!